"The more we do, the more we can do, but the more help we need to do well." 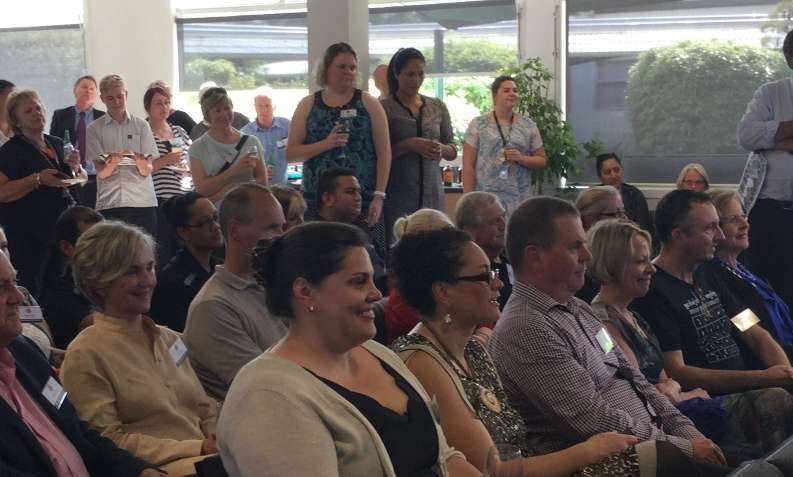 That was the key message by Principal Salvatore Gargiulo to an event held to thank a variety of people and organisations who have supported Manurewa High School in 2015. Once again this year, our students have demonstrated their amazing potential. They are natural performers and athletes, and they hold their own academically in a range of different competitions and challenges. Scan the Latest News on this website over the past year for many examples of these successes. 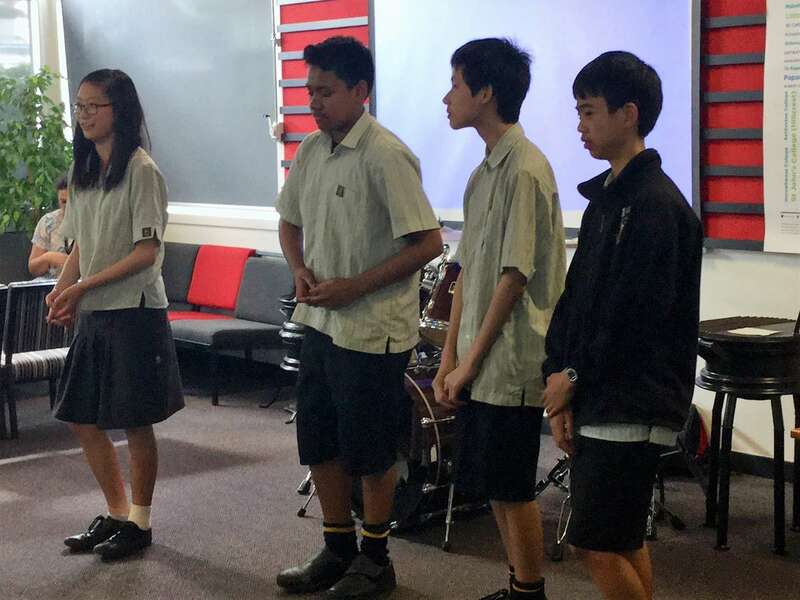 One of the most significant achievements this year has been for a group of Year 9s - John Chen, Okesene Fatu, Aimee Lew, and Aaron Lew - competing in the national final of the Future Problem Solving Challenge against schools they are not be expected to beat. This is the first time our school has participated in FPS, which makes success more significant. Coming second, they have won a place at the World Champs to be held in the United States in 2016. 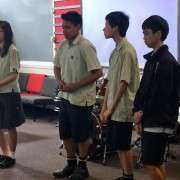 They told guests at our Thank You event that they are very excited about the opportunity to represent Manurewa High School on a global stage. Our involvement in FPS was made possible with the financial support of an anonymous benefactor. 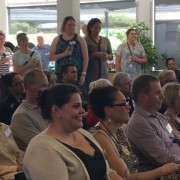 Science students have also been able to participate successfully in extension activities like the Otago University Innovation Challenge, with financial and other types of support from friends, alumni and organisations. Some of our Year 13s are now progressing into tertiary education through scholarships provided by alumni at the pinnacle of success in business, including John Hynds (Hynds Pipe Systems founder) and Mike Bennetts (Z Energy CEO). John and Leonie Hynds are also contributing substantially to the development of our Business Academy. "The more success we have, the more the bar is raised, and the harder it is to achieve at the highest levels," says Mr Gargiulo. "We want our supporters to know that we value your contribution. We encourage you to stay connected, and help us build on success." 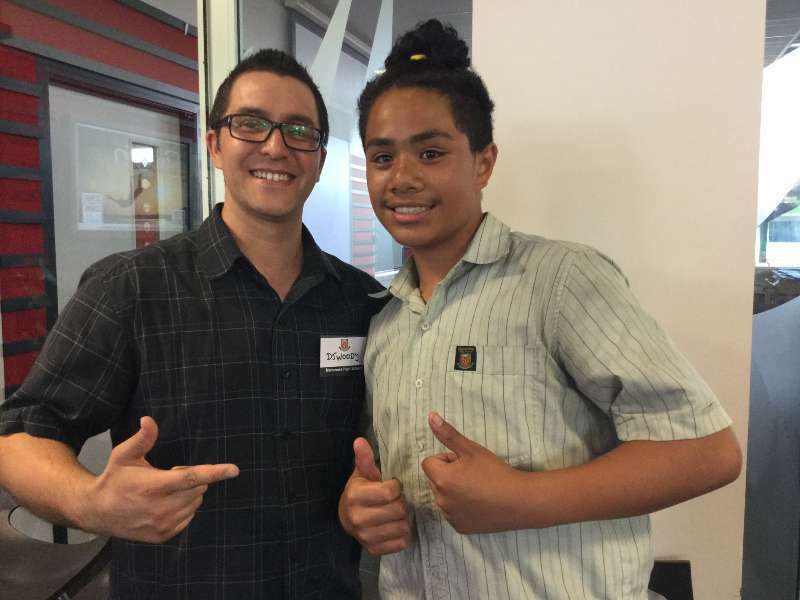 Put your hands together for Manurewa High School - his name Finau - year 9 student. 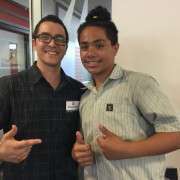 Guests enjoy presentations from our Future Problem Solvers, and drummer Finau Fulivai. Finau meets alumni James Woods (DJ Woody), whose career in Music began playing drums at MHS.